In December 2009 Zebra (Roel Meelkop & Frans de Waard) were invited to play a hommage to Martin Hannett, the legendary producer of Joy Division, A Certain Ratio and Section 25 (to mention Zebra's favorites). This was the start of a long Factory Records weekend in Brussels. 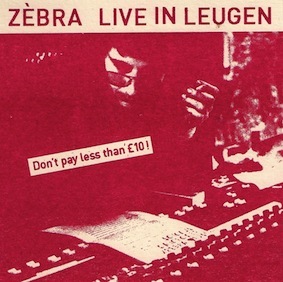 Zebra picked their favorite Martin Hannett productions and sprinkled them some further with their extraordinary electronic means to create a groovy, dense slab of music. This album is called 'Live In Leugen'. Leugen is the dutch word for lie, and so the album is a studio production, packed as a 'bootleg', which it isn't. Its a lie (again). Otherwise they are very serious in what they do. This a most sincere hommage to a great producer. Their second CD, following their well-aclaimed release on Symbolic Interaction.